Effortlessly stay up to date with your finances using our innovative smartphone apps. Run your business on the go, whenever or wherever you are. Business trip? Instantly record a mileage claim and out of pocket expenses. You can snap a photo of your hotel receipt on the app and it’s uploaded to the cloud – safe and secure. No bits of paper to dig out from your back pocket or the bottom of a bag. Our apps are free for inniAccounts customers. Unlike many of our competitors who utilise third parties apps with sliding scale charges for more receipts, every part of our software has been designed in-house with our client’s needs in mind. Login using your inniAccounts username and password. iPhone users can use Face or Touch ID for extra convenience once logged in for the first time. Our app brings the best of inniAccounts to your pocket. 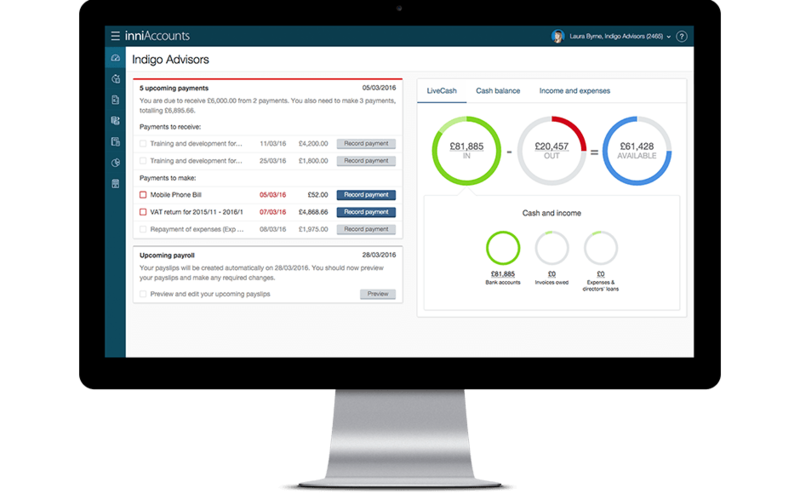 The app automatically syncs anything you change or input with the desktop version straightaway; so no matter what device you’re using, you’ll always have an accurate picture of your finances. Our app gives you instant access to LiveCash, our award winning real-time system that provides a live view of your business finances and the cash you have available. By accessing LiveCash through the app, you can quickly check whether you have upcoming bills, view your bank balance and see your upcoming payments – so you can confidently make decisions wherever you are. With a single tap, you can easily record the time you spend working for clients. Once you’ve completed your working day you can easily record the exact time you’ve spent working using the app, so you never under or overcharge. Once recorded, you’ll also be able to assign each record to the relevant contract. Sometimes it is necessary or convenient to purchase items using personal money instead of a business debit or credit card. With the inniAccounts app you can effortlessly log your personally incurred expenses. Have your latest purchase logged and the receipt uploaded before you’ve even left the shop. Keep track of your business journeys when using a personal vehicle with our intuitive apps. Mileage claims soon add up, so ensuring you record your mileage while out and about means you’ll never miss a trick. Snap a photo of your receipts on the go, so nothing goes forgotten. No more losing or hoarding paper receipts, with our app you can recycle them instantly; knowing with confidence that a copy of your receipt is securely stored in your inniAccounts software. Take a photo of a receipt whether paid from a business account or out of pocket to reclaim from your company, and they’ll be waiting for you to link up to the relevant transaction when you next use the desktop version. You can find more information on receipt capture and linking receipts to transactions here. The app is compatible with Android devices with version 5.1 and above installed or iOS version 10.3 and above. To use the inniAccounts app, an active internet connection is required. If you’re having any problems with our mobile apps, contact your Account Manager. We’ll work to solve any issues as quickly as we can. Security is our top priority. We’ve made it easy for you to manage, change and disable your inniAccounts app access. Login to inniAccounts software and select My Profile and Password to reset mobile access and to change your password. If you need to access the full website on your phone, simply visit https://secure.inniaccounts.co.uk in your mobile browser. We’ve designed our apps to take the hassle out of your daily admin and to enable you to confidently make decisions with a live view of your business. We’re constantly developing and improving how we work based on your needs and feedback, so be sure to keep your app updated so you can benefit from our new features.